Please go to your device and ensure that either one of the icons shown on the right is showing in the top right-hand corner. 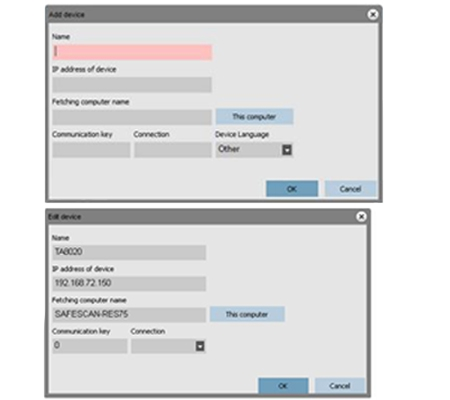 Log-In to the menu of your device, select “COMMS” and select one of the options below in accordance with the connection type you are using. 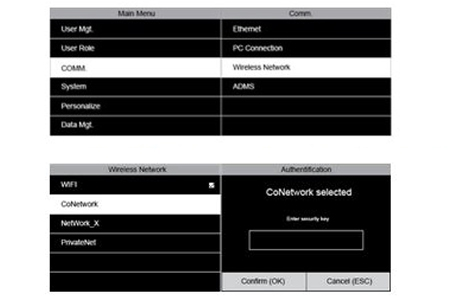 If you are using an Ethernet connection to connect your device to your TA/TA+ Software, please select Ethernet in your TA menu. 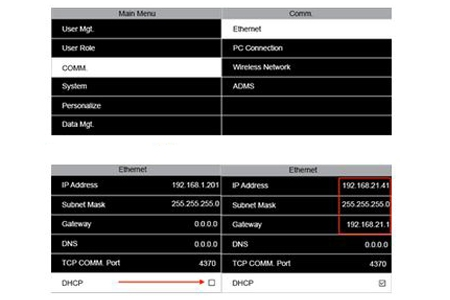 Within the Ethernet menu, you can see the IP address of your device. Please activate DHCP. If DHCP is already set, please deactivate DHCP first before activating DHCP again. The device will trigger a request to the DHCP server, to obtain a free IP Address. Please take a note of the IP address and log on to the TA/TA+ Software on your PC. Please then follow Step 3 in order to find your device within the network. 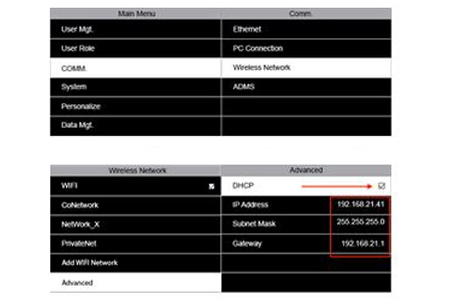 If you are using a Wi-Fi connection to connect your device to your TA/TA+ Software, please select Wireless Network in your TA menu. Scroll to the bottom of the menu and select the “Advanced” options. Within the time attendance Software, under “Device”, click the “Scan” button. A box should appear displaying the IP address of your device. If your device is already linked to your time attendance software, the IP parameters should have been updated accordingly. Please note that in some cases, the software will not be able to find the device automatically. If this is the case, click on the “Add” (+) button. A box will appear where you will be prompted to give a name to your device, specify the IP address you noted previously, and click on the ”This Computer” button to link the device to your PC. Press OK to save. You can then edit the IP parameters manually and save them by clicking “OK”. If you are struggling to connect the device via Ethernet, please ensure that the cable is plugged in correctly at the back of the device and ensure that the cable is communicating with your switch or router. You can ask your IT administrator to assist you. If both the above are correct then please follow Step 1 above. Log In into the menu and go to the Wi-Fi Section on the device. Make sure that Wi-Fi is enabled. If Wi-Fi is not enabled, please enable Wi-Fi. The Wi-Fi module will search for any available SSID your device can connect to. Select your SSID and if necessary, enter the Wi-Fi key. If the information is correctly entered, your device will connect to your wireless network with no problem. Once completed, please follow Step 2 above.